Well-maintained home in highly sought after Brushy Creek neighborhood. 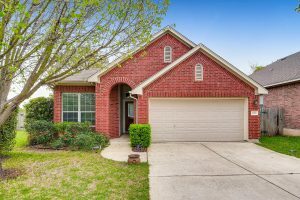 This 3/2 home features a spacious, open living and kitchen area with new carpets and fresh paint. Enjoy the formal dining area for entertaining and the backyard with gazebo. No neighbors in back, very private cul-de-sac, and a quick walk to the trails, parks, and pools!